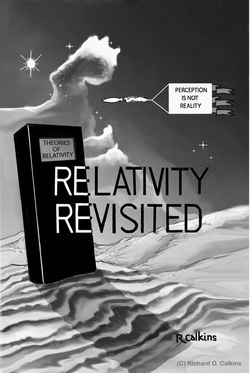 Relativity Revisited is the first book published by Calkins Publishing. It deals not only with relativity but also discusses the extent to which the foundation underlying quantum mechanics is based on questionable interpretations of the supporting data. The intellectual approach used in this book was based on the author’s experience when leading a group of long-range network planning engineers at the Pacific Northwest Bell Telephone Company. Telecommunications networks, by their very nature, are large, complex, constantly changing, interconnected with other networks, very expensive to build, long lived (hopefully), and capital intensive. When a company builds a major switching office or establishes new routes for the connecting facilities, it will take a long time to recover the capital invested. It also will tend to lock in future decisions regarding the network’s ongoing development by virtue of its location, existence as a resource, and the need to recover the remaining investment during its useful life. Clearly, successful network planning requires a really good crystal ball. Unfortunately, there are no crystal balls. How healthy will the economic environment be in the coming years? How rapidly will the particular area to be served by the investment develop? What new competitors might enter the market and what might existing competitors be planning? What new technologies will become available during the useful life of the planned investment? How quickly? How much better, cheaper, more reliable, etc. are they likely to be? Is World War III going to break out? Will the area served by the investment be attacked? Will there be a major famine or plague that significantly depletes the populace? Will there be a natural disaster (earthquake, tornado, tsunami, drought, etc.) during the expected life of the investment? How probable? What potential effect? The list of things which can make or break the proposed investment is literally endless. The types of issues described in the first set, above, can’t be ignored or overlooked. They require evaluation and documentation of the explicit assumptions being made in the study. Some of the types in the second set may require some form of explicit treatment. If the investment involves network facilities in an earthquake-prone area, it may already be addressed in building or other codes. However, if we choose to accept that as sufficient, we nevertheless are making an assumption that there will not be an earthquake during the life of the investment which exceeds the assumptions on which the codes are based. Others are so unlikely and so commonly accepted as being immaterial as to warrant being ignored. We aren’t even aware of a multitude of things which, by some stretch of imagination, might have a material effect on the decision. But by not even bothering to think about them we still are making implicit assumptions that they are not going to have any effect on the validity of the study’s conclusions. As manager of the network planning group, I never allowed a study to begin until after I approved the documentation of its underlying assumptions. However, I also looked for the implicit assumptions upon which the explicit assumptions were based. That is something like detective work, where the clues in evidence are assessed to find what is hidden within them. If there were significant implicit assumptions which underlay the documented assumptions and which were unreasonable or inconsistent, these had to be ironed out and the explicit assumptions revised accordingly. The work didn’t commence on the study until after I was satisfied with the assumptions upon which it would be based, both explicitly and, to the best of my ability, implicitly. It was this focus on assumptions that guided my examination of Einstein’s theories of relativity and of related theories that influenced them. Unfortunately, it appears that that approach has both strengths and weaknesses. The strength lies in its ability to identify inconsistencies between and among the underlying (implicit) assumptions upon which a theory’s interpretations of empirical data have been based. Its weakness is that in producing alternatives which disagree with the postulates and premises of the theory, the analyst is judged by professional physicists as being inadequately informed about the theory’s long history of empirical proof. Either that or he simply doesn’t understand the theory. As a result, it appears that the professional community considers Relativity Revisited as just another tiresome example of junk science. Fortunately, the story doesn’t end there. Based on the insights I developed while researching and writing Relativity Revisited, and considering the profession’s tepid response, I decided to take a new approach. I developed the changes in experimental design presented in The Problem With Relativity. This permitted an approach which could be based on complete adherence to the special theory’s own postulates and premises to address a question which has not previously been addressed. As one will find in that book, the special theory’s answers to the new question lead it to disprove itself. The Problem With Relativity does not change the findings in Relativity Revisited. What it does is face the profession with having to decide which of the theory’s conflicting predictions they agree with. Whichever ones they decide are correct, the others remain incorrect. Either way, the special theory remains self-refuted. Relativity Revisited remains valuable for two reasons. First, it covers issues involving the general theory and the problems with quantum mechanics which are not addressed in The Problem With Relativity. Second, it provides insights into the development of the thought process presented in The Problem With Relativity. Buy now from Amazon, Barnes & Noble, or order through your local book store. Following are some excerpts from Relativity Revisited which the reader may find to be of interest. Some might consider it unusual that this book was written by someone from outside the profession of physics. However, I believe there are sound reasons for that. Science is one of mankind’s most successful enterprises. The pace at which it progresses reasonably can be characterized as breathtaking. Scientists have achieved this success by a unique and powerful form of information management. Science is the study of the unknown universe guided by the entire body of what is known. Maximum progress occurs when everything that is discovered is made readily available to all. However, the acceptance of any new information that is incorrect jeopardizes everything that might be built upon it. This requires a method of distributing information in a manner that also validates it beyond reasonable doubt. The process of publication and peer review has proven to be remarkably effective at meeting this goal. Once new information has passed this rigorous review, it can be used with confidence to guide further exploration. It rarely is necessary to expend resources reexamining it unless a new discovery brings it back into question. Following retirement, I decided to renew my study of physics. Over the years, I have learned that there are basically two different mind-sets for how to study and evaluate complex structures, whether they be physical mechanisms or conceptual theories. One is to observe and assess the results of how they work and the other is to take them apart, see what they are made of and assess the role each piece plays in the whole. It seems to me that science typically is oriented more toward the former and engineers are oriented more toward the latter. As it happens, my experience in engineering makes me particularly favor the disassembly and autopsy approach to studying complex structures and theories. During my career, I spent several years as an Engineering Manager responsible for long range network planning at Pacific Northwest Bell. Long range planning also is an exercise in divining the unknown (in this case, future conditions and likely outcomes) guided by what is known (in this case, experience and current conditions). One of the things I learned from this experience is how critically the outcome of such a study depends on the validity of whatever assumptions may be harbored by the analyst making it. Indeed, it was common practice to begin each study by documenting every assumption that might influence its outcome. This necessarily involved some soul searching since everything we know is based on assumptions, some explicit and some implicit. And it is the assumptions that are allowed to remain implicit, and therefore unexamined, that are most likely to turn a great looking plan into an unforeseen disaster. As the manager of a long range planning group, I never allowed a study to begin until after I approved the documentation of its underlying assumptions. It was this focus on assumptions that guided my examination of Einstein’s theories of relativity and of related theories that influenced them. You will find that parts of this book read more like a detective story than a scientific analysis. That is because digging out hidden assumptions has much in common with detective work. One must start with the clues that are there and reconstruct the underlying beliefs that were necessary for their existence. Each of these then can be tested for validity on its own merits. Any failures necessarily are an indictment of the structure built upon them and create the need for further review. As presented in this book, that includes providing alternative hypotheses that correct for the invalid assumptions. I believe you will find the results of this process of more than passing interest. Throughout, I have tried to present my thought process clearly enough to make it accessible and understandable to any reader with a good high school foundation in science and mathematics. At the same time, I have tried to be rigorous enough to entice professional physicists into actually reexamining the foundations of what they know. I leave it to you to determine whether or not I have succeeded. 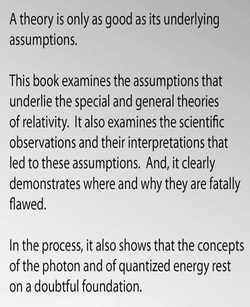 Chapter 1 demonstrates that both of the foundational assumptions of the special theory of relativity exceed the reach of the scientific observations on which they are based. Both are shown to be factually incorrect. The assumption that observations from every inertial frame of reference have equal merit requires us to accept optical illusions as reality. The assumption that light must be observed to travel at the “speed of light” when viewed from any inertial frame of reference creates the misperception that time and space are affected by motion. If we applied the same assumptions to the speed of sound, we would get the same intuitively nonsensical results as we do when we apply them to the speed of light. And, under those circumstances, we would have no hesitation in rejecting the assumptions as nonsense. We particularly would have trouble accepting the speed of sound as the absolute limit to velocity. The extent of our everyday familiarity with the behavior of sound inoculates us from accepting nonsensical predictions even from the most impressive mathematical theories. Unfortunately, the speed of light and many of its other characteristics are well beyond the comprehension of our senses. Much of our understanding of the nature of light is based on scientific experiments and the analysis of resulting mathematical equations. This has served to remove our understanding of light from the realm of common sense and transport it into the realm of abstract theory. This abstraction has seduced us into thinking that light is completely different from any other kind of wave. It even has led us to believe that the speed of light is a physical law unto itself. In the realm of abstract theory, we can learn to substitute the results of equations for the reasoning of our logical minds. Chapter 1 shows decisively that the assumptions produce nonsense as fully when applied to light as they do when applied to sound. All we have to know is what to look for. We must be more rigorous in discerning the difference between perception and reality. Chapters 2 and 3 lay groundwork for later chapters. Chapter 2 presents a heuristic analysis of why strong bonds must exist to hold electrons in orbit. It also shows how something as simple as electron spin can create bonds that are both strong and elastic, thus allowing electrons in orbit to act as effective oscillators. Chapter 3 demonstrates how the innate ambiguity of waves can cause significant conceptual errors in experiments. It demonstrates how the observed results of an experiment depend not only on the type of wave but on the specific mechanism of its creation, the circumstances of its medium of propagation and the capabilities of the specific mechanism used to detect it. It also shows how something as simple as reducing ambiguity regarding the trajectory of a beam of light unmasks an optical illusion and reverses the conclusions of commonly used examples of time dilation. Other examples are given throughout the book where failures to anticipate and address ambiguities led to invalid interpretations of scientific observations and to incorrect predictions of wave behavior. Chapter 4 reexamines the two most influential experiments leading to the particle theory of light. These are the experiments dealing with black body radiation and the photoelectric effect. The reexamination of black body radiation shows how conventional wave theory erred by allowing unexamined and incorrect implicit assumptions to shape predictions of wave behavior. It also shows how Max Planck’s solution was flawed by incorrect implicit assumptions regarding the nature of oscillators. Planck’s analysis also failed to address the unrecognized ambiguities caused by the characteristics of an unanticipated source of radiation (i.e., orbit jumps). It also demonstrates that generally accepted theories, if properly interpreted, are adequate to fully explain black body radiation without recourse to quantized energy. The reexamination of the photoelectric effect shows how conventional wave theory erred by dependence on incorrect implicit assumptions. It also shows how generally accepted theories, if properly interpreted, are adequate to explain the photoelectric effect without recourse to quantized particles of light. Chapter 5 examines the nature of optical refraction. It shows how the electric and magnetic fields of the charged particles in a prism can push and pull on the fields in a wave of light, thereby causing it to follow a meandering path. That meandering path slows the wave’s forward progress which causes the wave front to bend. Chapter 5 also identifies the conceptual errors that led to a scientific consensus that the sun’s corona is non-refractive. This consensus played a pivotal role in the scientific community’s universal acceptance of Einstein’s theories of relativity as having been validated beyond reasonable doubt. However, observations taken by a NASA probe in 1999 show that the density of magnetic fields in the sun’s corona is multiple orders of magnitude greater than previously believed. This indicates that the corona should be strongly refractive. Chapter 6 completes the analysis by examining the foundational assumption that extends the special theory to the general theory. Einstein extended the relativity of inertial motion (special theory) to the relativity of non-inertial motion (general theory) with the premise that acceleration and gravity are equivalent. Equivalence requires that every test an observer might make to distinguish between them, absent input from outside his frame of reference, must be unable to discern any difference. Since it was recognized that a beam of light would be seen to bend as it crosses a rapidly accelerating conveyance in deep space, Einstein was forced to assume that light also must be bent by gravity. However, as shown in Chapter 6, the apparent bending of a beam of light due to motion is an optical illusion, not the actual bending of light and is caused by velocity, not by acceleration. In a rapidly accelerating conveyance in deep space, the amount of apparent bend would continue to increase since the craft’s velocity would continue to increase. Thus, the two not only are different in kind, but can’t even be made to look the same. Chapter 7 states the essential conclusion of this text, examines how the problems with the theories of relativity and related theories occurred and recommends changes in methodology to reduce future exposure to similar problems. The essential conclusion of the analysis in this book can be stated in a single sentence: The universe is Newtonian except for the corpuscle, whose existence has not been proven. How can we have believed in it so unquestioningly for so long? The answers to the first question pop up repeatedly throughout this text. First, interpretations of experimental observations and resulting theoretical predictions are shown repeatedly to have been influenced by implicit assumptions that were incorrect. Second, incorrect interpretations and predictions also resulted from failures to anticipate and address the innate ambiguities of electromagnetic waves. Finally, we find a recurring tendency to accept perception for reality. Indeed, the foundational assumptions of the special theory command us to treat perceptions as reality. The answer to the second question resides in a set of coincidences so unlikely as to be too improbable for a work of fiction. For example, it is in the very nature of the special theory to be self-validating. It is built specifically to predict what we will perceive when we observe events from disparate inertial frames of reference. It does that very well. Thus, we routinely experience the comforting feedback of predictions fulfilled. Unfortunately, our perceptions differ from what actually happens because of motion-induced illusions. Our only error lies in accepting the predicted illusions as reality and adjusting clocks and rulers where the events occurred to fulfill our expectations. To extend the relativity of motion from inertial to non-inertial (accelerative) movement, Einstein reasoned that acceleration and gravity must be equivalent. If there is no test that can determine whether one is stationary in a gravitational field or is accelerating in the absence of gravity, then non-inertial motion is relative. An observer in an upwardly accelerating elevator in deep space might shine a flashlight across the elevator to determine his state of motion. If the elevator is accelerating upward, the effect of the acceleration would cause the beam to bend downward. To maintain equivalence, Einstein was compelled to assume that light also would bend if the elevator were stationary in a strong gravitational field. In 1919, Sir Arthur Eddington observed a full solar eclipse for the sole purpose of determining whether or not light would bend as it passed by the sun. He observed the light from a star of known location just behind the edge of the shaded sun being bent as it passed near the sun. Since the sun was “known” to be non-refractive, Eddington concluded that Einstein’s general theory of relativity was proven to be valid. Eddington and the scientific community, apparently inadvertently, treated Einstein’s assumption that light would be bent by gravity as a prediction of the general theory. [iii] (Because that assumption is an integral part of its foundation, the general theory could hardly predict otherwise.) The ability of the theory to (presumably independently) predict something as improbable and counterintuitive as light being bent by gravity was accepted as incontrovertible proof of the theory’s validity. Since the special theory is just the general theory restricted to inertial states of motion, the validation of the general theory applied equally to the special theory. Following this unequivocal affirmation of Einstein and his theories, our belief in them became so complete that even when questions occurred, or should have occurred, we suspended our disbelief. As discussed in Chapter 1, the impossible prediction of the paradoxical twins is dismissed with explanations that, at best, are internally inconsistent. A properly constructed thought experiment shows that the prediction of the paradoxical twins leads into a cul-de-sac from which there is no escape. No one checked what an observer actually would “see” if he shines a flashlight across a conveyance under conditions of uniform velocity. Had they done so, the error in Einstein’s assumption that light would behave the same in response to gravity as it would in response to acceleration would have been shown to be impossible. The indication of the high viscosity of electric and magnetic fields in the sun’s corona has been published for some 12 years. While this may have been of interest to scientists working in the area of thermodynamics, it appears that there has been no curiosity about what it might mean to the conclusion drawn from Eddington’s observation of the 1919 eclipse. The third question raised at the beginning of this chapter was how to avoid having something like this happen in the future. The answer, unfortunately, is that we probably can’t. To err is human, and even the most highly trained and studiously objective scientist still is human. However, there are some things we can do to greatly improve our odds of avoiding errors or, at least, of detecting them more quickly. It would be worthwhile to formalize the need for experimental and theoretical scientists to examine and document every assumption that might have an impact on their analysis. This necessarily involves some real soul searching, since so much of what we “know” is infected with implicit assumptions. It might be worthwhile to have a section in scientific reports that is dedicated to that requirement. It also would allow reviewers to determine more quickly if there are either problems with an assumption or apparent gaps in explaining how some of the explicit statements were adopted. Scientific education and analytical studies could benefit from a higher level of explicit consideration of the innate ambiguities in physical phenomena. Chapter 3 addresses this issue as it relates to wave behavior, but the problem can be expected to occur in many fields. What we observe in an experiment is as much affected by how we choose to measure what we observe as it is by the innate characteristics that are there to be measured. To permit future reexamination of results, we must keep excruciatingly detailed records of the specific apparatus, set up and methods of observation. We also must design the experiment with potential ambiguities in mind. The very choices of methodology are based on what we think we are looking for. Another name for that is our assumptions about the nature of the phenomenon we wish to observe. Since we are doing the experiment to learn things we don’t yet know, we must be very careful about the information we depend on to design the experiment. Especially dangerous are things we know from prior experience in related matters that may not be entirely accurate in the one under study. As a long range planner, I considered any study to be incomplete and unreliable if it didn’t have several different scenarios for how to address the issue under study. The evaluation of their relative merits under different conditions than those considered to be the most likely provided critical insights as to the potential robustness of a plan. The equivalent for a scientific experiment or theoretical analysis would be to develop more than one view of what the observations might mean or how the observed phenomena might have been created. For example, Max Planck’s interpretation of black body radiation failed to consider that there was more than one kind of source for electromagnetic emissions and that they produced emissions with very different characteristics (i.e., oscillators and orbit jumps). There may be merit in adding the “autopsy” of a generally accepted theory to the list of study assignments for graduate students. It would teach them to hunt for unstated assumptions that affected the analysis and to consider alternative interpretations of observations. It also would help them become more aware of how the experimental methods chosen may have allowed possible characteristics to remain hidden. Who knows what we might learn from a determined examination of things we take for granted? [ii] However, as we learned in Chapter 5, observations made by a NASA probe in 1999 show that the magnetic and electric fields in the corona are multiple orders of magnitude more dense than previously believed. Apparently, the violence of the movements of matter in the body of the sun casts the presence of their fields farther than we thought. [iii] Goldsmith, Einstein, 164, Giancoli, Physics, 949. [iv] Goldsmith, Einstein, 124, 165. [v] Also, remember from Chapter 3 that the perception of different speeds in the two frames of reference was caused by an ambiguity of the wave. The observer in the spaceship is not in the wave’s frame of reference. Accordingly, he must correct his observations of the light’s trajectory for the effect of his movement. For example, he will see the light travel vertically only when the horizontal component of its trajectory is equal to his own horizontal velocity.